Are you wondering how to wear cuffed jeans? 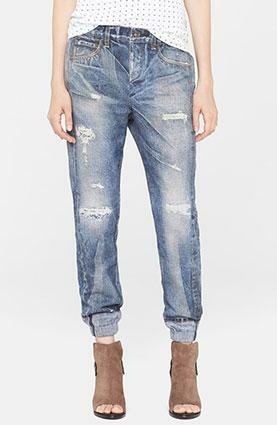 Cuffed jeans are a simple way to make yourself look stylish without much effort. With cuffs, you can change the way a plain old pair of jeans looks entirely, and without any cost to you. A cuff on a pair of jeans is a turned-up fold along the bottom of the trouser leg. It can be wide or slim, depending on trends or preference. Try these styles to add life to tired denim looks. 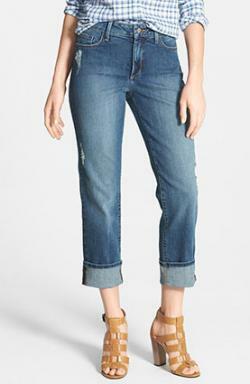 With a slimmer pair of jeans and flats, you'll find the traditional cuffed pant a tad bothersome. 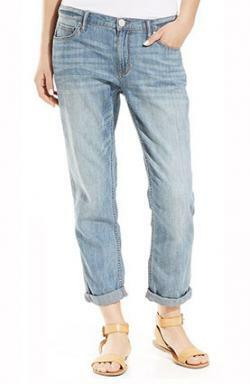 Instead, wear your cuffed jeans above the ankle with a pair of driving mocs or similar classic flat shoes. This also looks awesome during the cold months when paired with your favorite pair of ankle booties! You will love the look! For a less pronounced cuff, opt for a skinny cuff. To get this look, cuff your jeans just a little bit for a tiny roll of a cuff. You can try this with a dark pair of indigo jeans, which will make the look less noticeable, and then graduate to lighter jeans instead. Fold your jeans up only once to show the selvage (the finished edge of the fabric) and leave it at that. Choose the best height cuff for your shoes of choice - heels can either get a super high, ankle-baring cuff, or a medium-height one that flashes heel from underneath. Cuff your jeans when they have special seam finishing inside to show off the details of their premier labeling. This can include French seaming, colored serging, or stamping along the inside. For a much dressier cuffed denim look, start with a pair of skinny jeans and cuff them to your liking, pairing them strategically with your favorite pair of pumps - or wedges in the summer time! This is great for a night out on the town! Have you noticed how denim that is ripped and slashed with large holes -on purpose - are increasingly becoming more and more popular? For a more casual look, start with your favorite pair of destroyed denim and roll them a couple times at the bottom, pairing with your favorite casual shoes for year 'round style! Sometimes, cuffed jeans can go bad. Here are a few looks that won't work well. Wide cuffs look bad when they are paired with shoes like t-straps, espadrilles, or Mary Janes, as well as those embellished heels with a lot of beading or stitching. Avoid knotting strappy sandals over the cuffs of your denim. This look is strange and sloppy. Instead, save your strappy sandals for shorts, skirts or - if you must pair them with pants - Capris. Don't re-cuff your pre-cuffed jeans, as this will lead to an excessively bulky look. If they are too long, and you bought them cuffed, you can bring them to the tailor to be fixed. The tailor will be able to detach the bottom portion and then reattach it to the shortened jean. Still looking for more cuffing tips? Here you go! 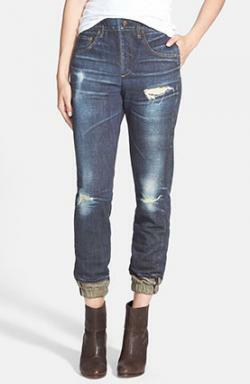 Cuff skinnier jeans with a single-roll cuff to keep a sleek silhouette. 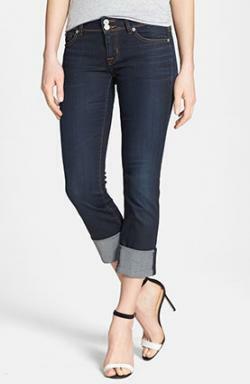 Try wider cuffs on jeans with a slightly bootcut look- they make great capris with thong sandals. Iron your cuffs after you decide where the placement is best for the freshest look. Experiment with skinny cuffs when wearing boyfriend jeans and heels. If you love the look of cuffed jeans, buy pre-cuffed styles that dispense with the bother of experimenting with cuff thickness and effects. Now that you know how to wear cuffed jeans, go ahead and get cuffing. You'll be able to step out in style, getting multiple looks from the same pair of jeans.